We have developed a suite of computational analysis tools that show promise for helping resolve today's foremost environmental problem - air pollution and global warming. There is broad concensus opinion that greenhouse gas emissions (CO2 and NOx) and their effect on Earth's ozone layer, are the principle contributors to global warming. Greenhouse gas emissions in 1996 increased at the highest rate in a decade. Without measures to combat these emissions, it is estimated that total annual U.S. economic losses by 2025 will exceed $50 billion. While evidence exists of emissions growth proceeding unchecked, national and global attention has recently focused on technologies to slow and even reverse the damage. It is estimated that one-third of these emissions are produced by automobiles. Working with industrial partners, and with support of the U.S DOE, ORNL has developed a new spark ignition model and integrated it into the KIVA-3 engine combustion model. This new spark ignition model solves time-dependent equations of electromagnetic fields, thus accounting for a dynamic exchange with the fluid field. 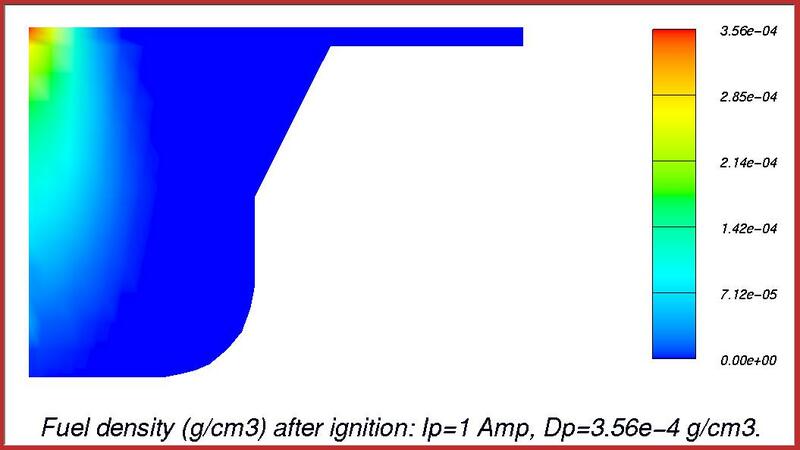 This is, by far, the most detailed computation of spark-ignition and its integration into the flow dynamics, and it provides us with means to correlate engine output and spark input parameters (such as the discharge current and breakdown voltage values as well as the spark duration). It is expected to have an impact on the design of combustion engines by defining lean fuel limits and optimum spark energies which will result in lower fuel consumption, more efficient fuel burning and reduced emissions. The motivation behind this new spark ignition model effort was to more accuratly compute the spark energy deposition. The amount of energy deposition greatly effect the flame propogation and densities of hazardous species as seen in our results here. 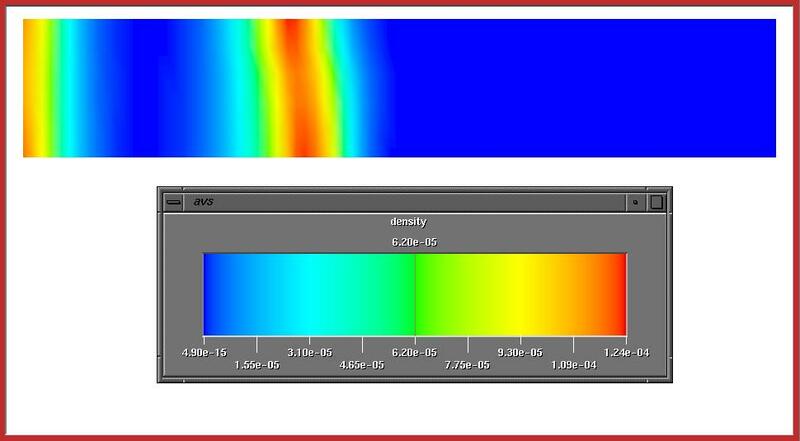 Our model takes as input the spark current and this enables us to correlate the engine outputs to spark related parameters. During the sparking event, we solve time-dependent electromagnetic equations and compute the Ohmic heat term that appears in the gas energy equation. The computational model produces 1.6 - 5.0 gigabytes of data per piston cycle, depending on the computed parameters and based on granularity of spatial and temporal output. The enormity of the data makes visualization a necessity for scientific interpretation. Our current visualization paradigm utilizes a custom reader for the commercial AVS visualization toolkit. 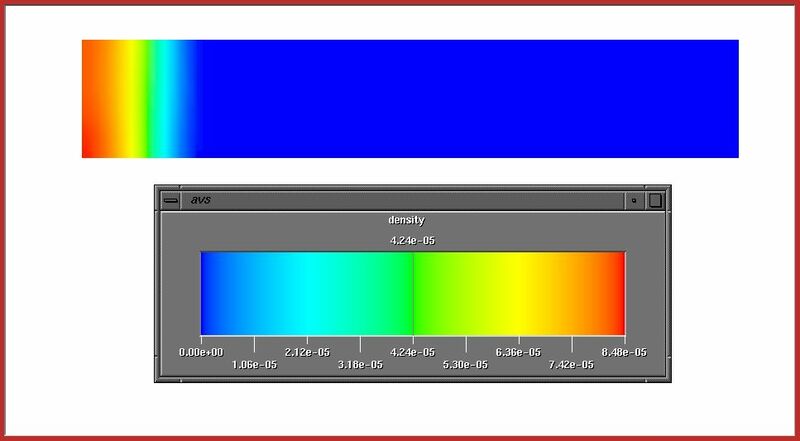 AVS affords scientists the flexibility to visualize the computational results in a way that is particularly meaningful. The Sandia-developed EIGEN/VR virtual environment is used to render the customized 3-D visualizations at immersive speeds, and navigate interactively. EIGEN/VR's rendering speed has proven invaluable in understanding the relationships of computed parameters and the time-transient effects of changes in initial conditions. Viewing the 3-D simulation results via EIGEN/VR in a dynamic way produces a smooth motion of the piston and a better understanding of the compression and expansion strokes of the engine as a whole. One example of this is an observation of a double pulse in the temperature following ignition. At first questionable, this phenomena is well understood in a very short time through viewing other physical variables during the whole engine cycle. The availability of temporal and spatial distribution of all physical quantities (density, pressure, velocity field) under EIGEN/VR and user's access to it within seconds timeframe shortens the process of understanding the observed phenomena. 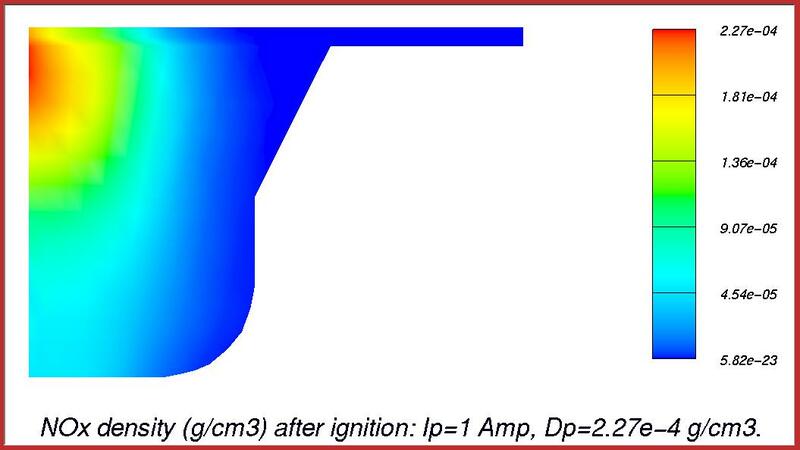 The fuel injection and ignition processes are started a little before the end of the compression stroke in an effort to maximize the air-fuel mixing and to enhance turbulence effects on flame propagation. 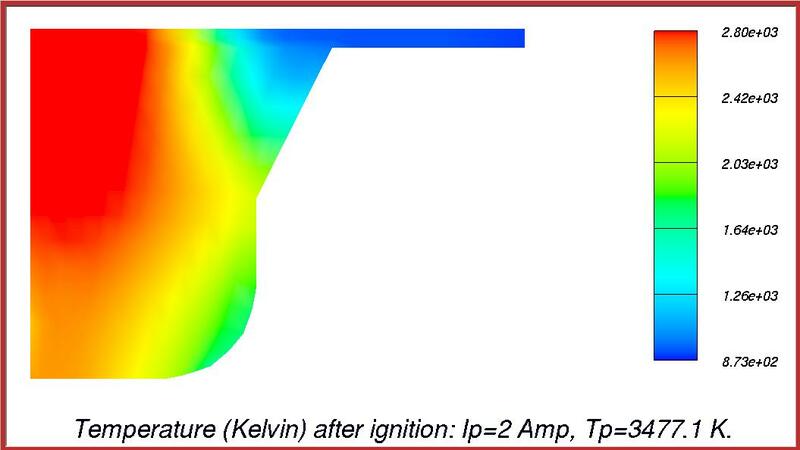 The fuel injection time and ignition time can be optimized to the best extent possible by observing the flame propagation and specific fuel comsumption via 3-D animations using tools as EIGEN/VR. 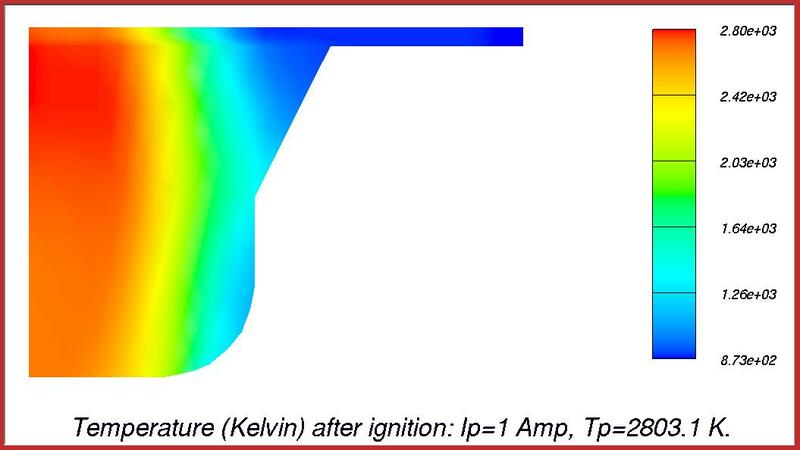 We plan explore the use of CUMULVS to facilitate dynamic data passing between our combustion model and AVS. CUMULVS may eliminate the current postprocessing bottleneck we are experiencing with our custom reader for AVS. The reader takes up to a minute to convert the geometry and parameters to an internal data structure, significantly delaying the visualization process. Additionally, CUMULVS will be investigated to assess the value of computational steering as applied to our spark-enhanced version of KIVA-3. As an alternative to commercial packages such as AVS, University of Stuttgart's COVISE may be used to deliver customizable visualizations. In addition, COVISE opens possibilities for collaborative visualization and can drive the EIGEN/VR renderer. MPI version of KIVA-3 is also underway to make it more portable and usable in a heteregenous computing environment. 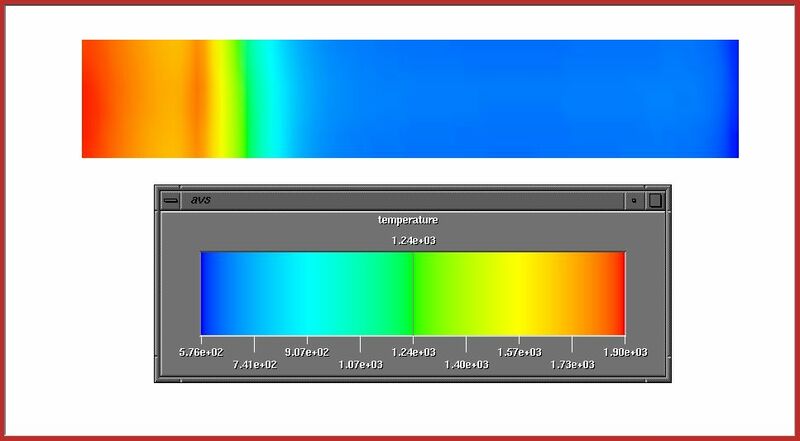 We have examined the combustion output (i.e., temperature, NOx density) against spark current (energy) and fuel density. The qualitative nature of an engine response against varying degrees of spark energy input and air/fuel ratio has been predicted, but a direct quantitative correlation between engine output and spark parameters in a time-dependent way has never been done. 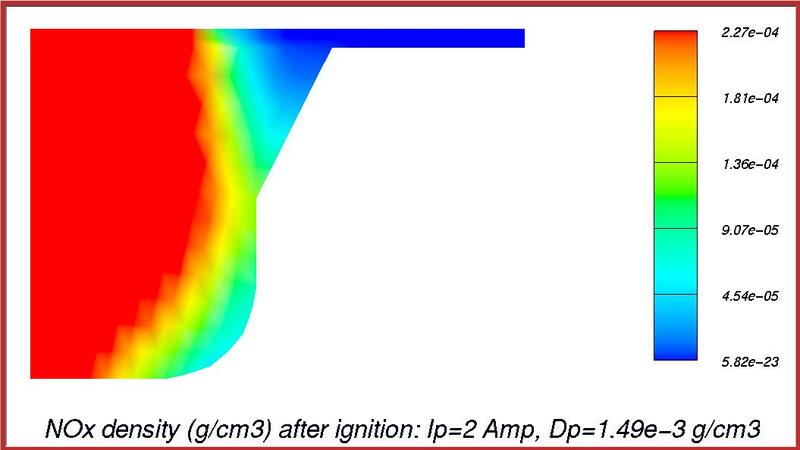 Early flame formation and propagation has a vital impact on the engine performance and emissions. The energy input (via sparking event) to the system determines the combustion efficiency. While lean combustion is very desirable from an efficiency and emissions standpoint, it is constrained by the potential for partial burns and misfires that result in poor performance and higher emissions. By operating with lean mixture, the efficiency and specific fuel consumption of the engine can be increased, while reducing NOx and other toxic emissions. However, the decrease in the fuel/air ratio is limited by the increasing cyclic variability which results in some cycles either not burning completely or not igniting at all. Finding optimum operating conditions is important not only from energy efficiency and emissions point of view, but also from durability of engine equipment, such as spark plugs. Some engines require costly plug replacement very often. Spark plug wear is caused by corrosion of electrodes that results from high temperatures and high voltages. 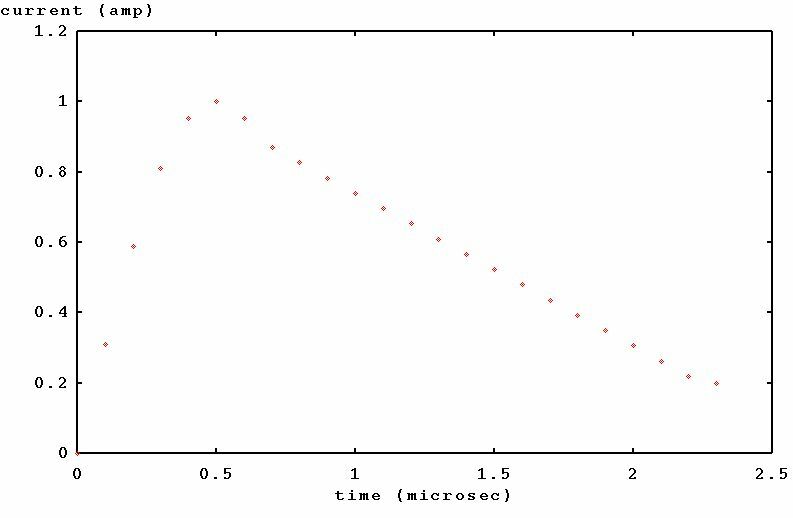 As a result, the spark gap gets bigger over time, requiring even higher voltages to ignite. This process continues until the electrical limits of the spark system is reached. The ability to reliably ignite the fuel mixture at low voltages with a smaller gap would extend the time before one reaches the highest gap distance and voltages allowed by the system prior to a system breakdown (end of plug lifetime). We will continue working closely with industry and try to develop capabilties that would help create new designs. Our spark ignition model is still under further development. It will soon include more details about the spark plug geometry and the heat loss to the electrodes, an improved plasma resistivity model, an expanded equation of state (EOS) and chemical database for high tempratures as well as mesh generation and running fine-grain problems on both symmetric shared-memory and distributed-memory multiprocesser systems. Our message-passing version of KIVA-3 has been recognized as a serious step forward in solving large-scale problems on scalable systems. We work closely with other code developers. We are also working on turbulence and radiation model improvements and will expand our scalable combustion technology to bolier industry and the diesel vehicles. 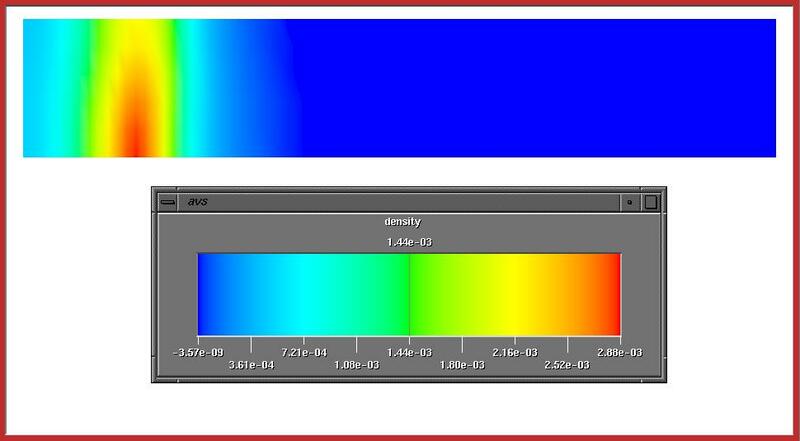 Our current work has been developed on top of KIVA-3 and our plasma and radiation hydrodynamics codes. Below are preliminary results of our 2-D and 3-D flat-piston and bowl-piston cases. 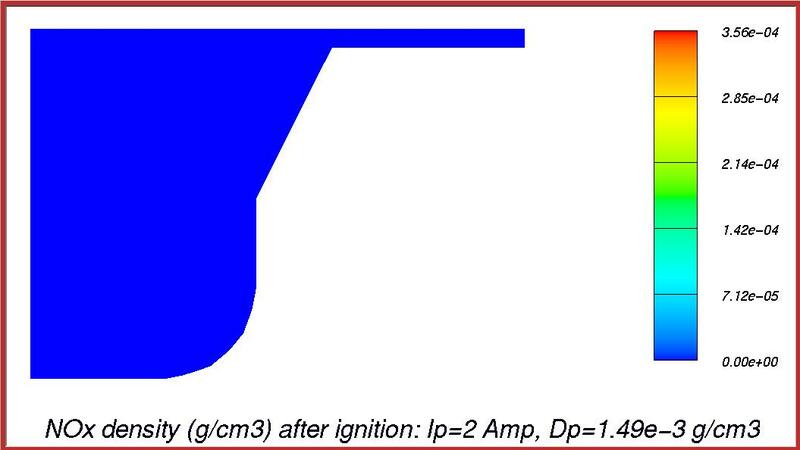 Basic geometry of the reciprocating internal combustion engine (with a piston bowl) can be seen in Fig. 1. A typical profile (measured) of spark current is seen in Fig. 2. 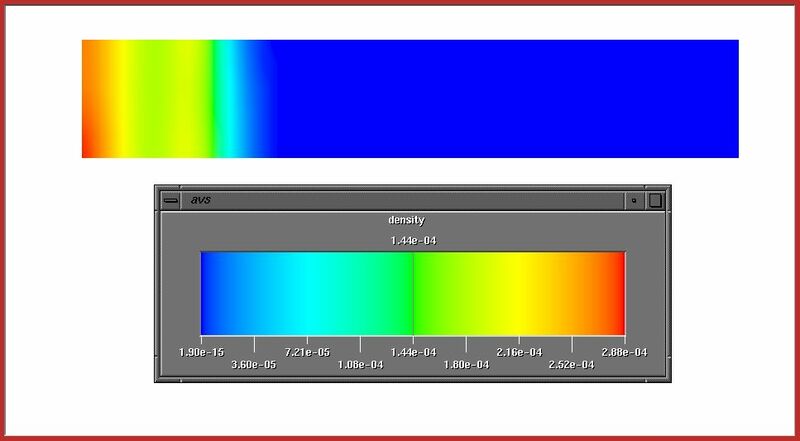 The measurement of spark current profile represent a significant task. As our techniques of current measurements get fine-tuned, this profile might change as we expect to capture short-duration (nanosecond) pulses in the early times of sparking event. 2-D flat & bowl pistons: The 2-D flat piston results are given at 30 degree after top-dead-center (Crank Angle= 30 TDC). TDC is when the piston is all the way up at the closest distance to the cylinder head. What is shown here is a 2D illustration of 1/4th of the cylindrical combustion chamber in which the left face is the axis of the cylinder, the right face is the cylinder wall, the lower part is the piston face and the upper part is the cylinder head. Results show an expanding flame front in the radial direction (from left to the right). The plasma energy is dominant in the early stages of the flame propagation, but chemical energy (combustion) catches on later and what can be seen in these figures is the effect of spark current and the fuel density on the expansion rate and radius. Future results will illustrate what effects of different stages (breakdown, arc, glow) of the spark energy deposition is on combustion rate. One distinct feature of our new SI model seems to be the details it can capture around and behind the flame front in comparision to what most other codes can do. Since we are computing the spark energy deposition as a result of computed current density and the electromagnetic fields (which have spatial and temporal distributions) the spatial distribution of flame propagation becomes very distinct. Preliminary 3-D results have been obtained on a baseline engine with a spark plug located at the cylinder head. Temperature, NOx density, and fuel density profiles during early times of ignition (25 degree before the top-dead-center, Crank Angle= -25 TDC) are shown here for 3 different cases in which we vary spark input energy (current) and the fuel density to observe the effect on the NOx emissions. Modifications to the current peak value produce significantly different computational results. Higher current produces more energy in the combustion chamber, resulting in higher temperatures which, in turn, produce more NOx. As more energy is deposited into the background gas, the rate of flame expansion increases. It is quite clear from the visualizations that flame in the higher current case expands more in all directions. This is desirable for having a more complete and uniform combustion, but it will produce more NOx. The peak value of NOx production, the amount and expansion rate of the NOx zone, and fuel consumption are higher for the higher current case as well. Changes in fuel density produce noteworthy changes in the system. Less fuel produces a lower peak temperature, thus NOx production decreases with less fuel usage. Another observation is that as more fuel is burned, the leftover fuel is pushed further away due to the mechanical expansion of the pressure wave. The higher the energy deposition at the early flame propagation times, the further the leftover fuel is pushed away. The concentrated fuel region moves down to the bottom of the piston bowl as it gets burned. Less fuel in the system produces less resistance to the mechanical expansion of the flame. The mechanical conditions of a chamber are known to greatly affect the flame propagation. The flame propagation distance is directly related to air/fuel ratio as well as the pressure and physical length scales of the system.